Awhile back, Rachel and I went to the Aquarium where we saw a SCUBA diver feeding the fish. Rachel commented that it would be cool to do, so at that point I decided that we had to hit up Catalina and try it sometime. So this morning was spent underwater. Now I have a bad habit of wanting to pick up every hobby I try, but it really was amazing. 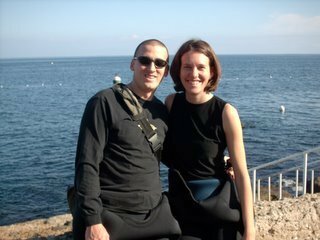 We did an introductory dive on the coast of Catalina at a dive park. At first it was a bit odd. It’s hard to breathe and my body was telling me that it’s not supposed to be submerged completely for prolonged amounts of time. But as time went on, I got used to it. Then we were able to let go of the buoy rope and the instructor led us through forests of kelp with tons of fish and sea life swimming all around us. This site is the dive shop we went with and gives you a small idea what it’s like. WOW! It was such an amazing experience. Rachel commented that it really is like being in a whole different world. God’s creation is so amazing. For me it was so peaceful and everything around seemed so majectic. We saw an octopus hiding in a hole, I touched a cool looking bottom fish (kinda like a halibut), and the color and size of some of the other fish was amazing. 1) God is an amazing creator. The diversity and amount of life in that small area at the depth of 40 feet was unbelievable. I can’t even imagine the expanse of the rest of the ocean that covers a majority of the Earth. 2) I gotta get certified and do this more often! Somehow, I don’t think Rachel will be a big fan of that one. Maybe someday. I guess I’ll just put it on the list along with rock climbing and skydiving. Hey, if I ever win the lottery (if I ever start playing the lottery) I’ll have plenty of hobbies and certifications to use the money on! Hey Bobby and Rachel. 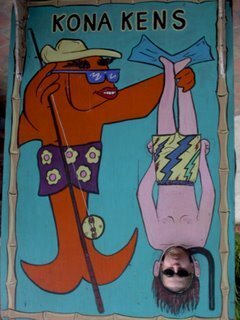 Tim Lasch and I got a chance to SCUBA in Hawaii a few years ago, and it was so amazing. I did freak out a little at one point and had to swim to the surface, but then I relaxed and enjoyed it. You’re right, it is not normal to be so far underwater for that long. We saw a 5 ft. reef shark while we were exploring, and our instructor caught it on video – very cool. I’m glad you guys are enjoying yourself. See you soon! It’s great to hear you guys are having an adventurous time in Catalina. You guys deserve it!